Sometimes it's important to make a great impression. These designer shirts are sure to stand out and make sure that people remember you. Each one features intricate and cool designs that are very creative and extremely unique. Show off your personality and make an impression when it matters the most. These are not just cool fashion shirts because they are also somewhat collectible. Each one is numbered and only a limited number are offered for sale. This is wearable art. Each shirt incorporates one of a kind details such as hand beading and/or hand embroidery. This is a pure cotton shirt featuring a unique, abstract pattern. The design was created using a mix of digital print and applique work. Details include multicolored felt buttons and beading. This is a cotton jacquard shirt with a geometric pattern that is combined with Buddhist symbols. The symbols are used to represent the universe. There is a geometric applique symbol on the back that is very interesting. Accents include Swarovski crystal buttons and gold lurex thread. This amazing shirt is a wearable work of art that depicts Sheman warriors, Tibetan architecture and more. The contrasting black cuffs add even more character as does a depiction of an ornate temple door. This is a cotton shirt with a tailored fit. This colorful shirt features an interesting combination of design elements. It was inspired by the well-known legend of Atlantis. The design features an underwater landscape and many of the elements are on the back of the shirt. This interesting combination of colors and fantasy imagery of mermaids is sure to turn heads wherever you go. This is a 100% cotton shirt with an ornately embroidered motif on the back. It is inspired by traveling and has a very unique style. The cuffs are silk and the design is sure to turn heads. This shirt is a mix of satin and cotton. It features a highly detailed floral and paisley design. The attention to detail is amazing, you will feel like you are wearing a one of a kind work of art. This design was inspired by the creators' love of several 1920s expressionists. Expressionism is a form of abstract art that involves distortion and conveying emotion. The design encompasses detailed embroidery and printed elements. This is a linen shirt with a design that is surprising and very colorful. This modern design is bright and the patterns were inspired by a kaleidoscope. It is a very creative shirt and it is 100% cotton. A combination of print, embroidery, and applique has been used to create the artwork. 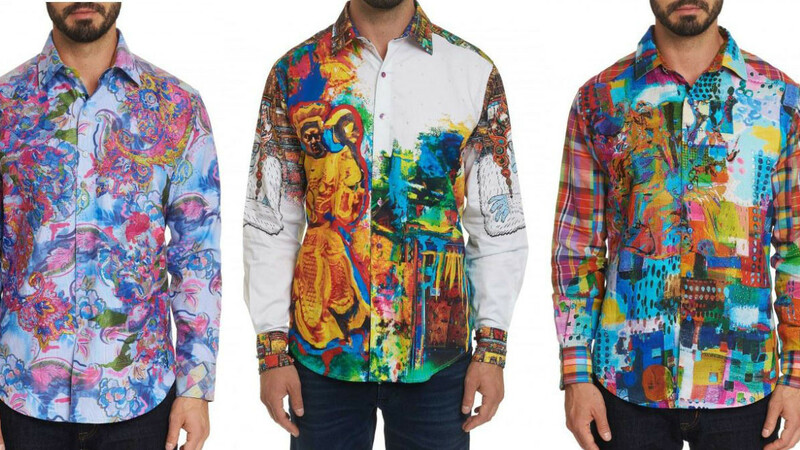 You are sure to stand out in any crowd when you are wearing this amazing men's designer shirt. The front of this shirt features a classy embroidered pattern featuring a damask motif. On the back, there is a signature skull that is designed to look like a gladiator. Finishing touches include Swarovski crystal buttons, hand embroidery, and hand beading. This is a very classy version of the traditional Hawaiian shirt. The design is a blend of exotic florals and swirl like embroideries. On the back of the shirt, there is an ornate paisley design. Gold thread is used on the cuffs and the buttons are made from leather and wood. This beautiful shirt is perfect for any romantic or special occasion. The design features a Buddhist inspired scroll overlay and rainbow colored roses. It features unique, one of a kind details such as embroidery. The shirt is 65% cotton and 35% polyester. If you like these amazing shirts then you might also like to check out the following.